Caching has been a part of our vocabulary, thanks to web browsers and their implementation of the same, but in this post, let’s try to go beyond the layman’s understanding of caching and implement it in our website to increase efficiency. As your site grows, you would realize that you need to change your strategy to manage all the new traffic you get — right from scaling up your servers to making sure you increase the efficiency along the way. In the simplest of terms, a cache is a temporary storage, and caching is the process of storing data in a cache. How does that help a WordPress webmaster? Let’s break down the steps of what happens behind the scenes when a reader opens a page on your site. First, the browser sends a request to the URL on your site. Your web server responds to the request by making a few database queries to get information like title, body, and comments, and returns an HTML document. This HTML document is read by the browser and rendered as a page that you see — which is possible by downloading all the stylesheets, scripts and images associated with the HTML document. There’s a possibility of delay at each step in the process described above. Your web server may be down with too many requests, your database server may not be responding, the server which hosts other files like scripts and images may be unresponsive. Caching helps remove some of these steps in between by creating copies of commonly requested items like database queries, images or whole pages. Caching is beneficial when you host content that doesn’t change much over time — such as a match report about the recent World Cup final. You can simply cache a version of the page which is rendered every time a user visits the link. Am I “Big” Enough to Need Caching? As evident from this discussion on Stack Exchange, there’s no pre-set limit of how “big” you need to be to enable caching. Although complex sites need it more, extra speed through better efficiency is always welcome — leaving you with happier readers and a lower bill. Various studies have shown that an increase in load times leads to users abandoning the page. For instance, a half-second delay could lead to 20% less traffic, and drop of a second in load times for Amazon could lead to loss of $1.6 billion revenue in a year. Google even uses load times as an important parameter to determine the ranking of websites. In short, one must always be on the lookout to improve performance of their websites, and caching is a way to achieve this. 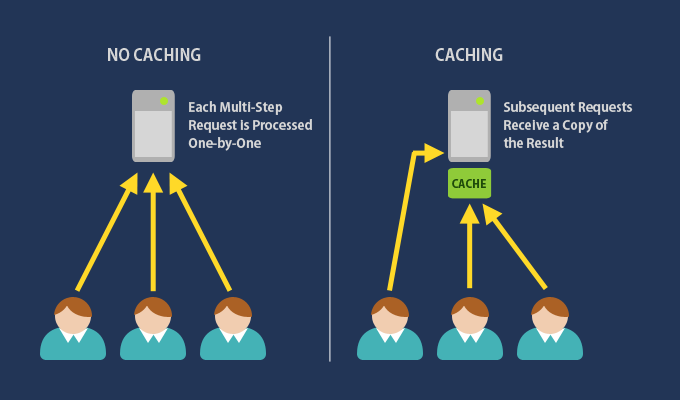 Let’s understand the various types of caching before we implement them. Broadly speaking, caching techniques can be grouped into two — client-side and server-side caching. Remember the need to “clear the cache”? That’s caching done by the browser. The most common way of client-side caching is browser caching. A browser may store files related to a web page and render it without making a request. Depending on the user’s settings, the browser may store only static files (such as stylesheets, scripts and images) or even the web page as a whole. It’s worth noting that a client-side cache is built when a user first visits a website, and works on subsequent visits. Opcode Cache: PHP code may be compiled and saved after a request, which avoids the need to process the same file in subsequent requests. Unlike client-side caching, a cache on the server can be built when content is created or edited. Therefore, even when a reader is visiting a site for the first time, a server cache might be in use, which leads to lower load times. There are many techniques associated with caching that are often bundled with caching plugins, but which you can achieve independently too. We’ll discuss a few of these techniques here. The response sent by the server to the browser is a simple text file. The server may compress this text before sending it, thereby bringing down the size of the content to be sent. This saves bandwidth, and therefore brings down costs. Some plugins may use the term GZIP compression for HTTP compression. Content delivery networks (CDNs) work under the premise that a server that is geographically closer to a client serves information in lesser time. A CDN refers to a network of servers distributed across the globe which decides which server to use depending on the location of the client. If you host your static files such as images on CDNs, it rests on most of the servers of the CDN and the server closest to your reader is selected to render the file. Every stylesheet, script or image is loaded through a separate request to the server. The greater the size of these files and the number of requests, the longer time it takes to render the page. Minification is a technique that removes all unnecessary characters from your source code (like whitespaces) and makes the size of the file smaller. As a next step, certain plugins also combine all similar files into one to bring down the number of HTTP requests. Yet another technique to improve your page performance is reformatting images for the Web. Before using them on your pages, you can compress and resize images to bring down the file size. Let’s now explore three of the most popular caching plugins in WordPress. Comet Cache, a popular plugin, provides a one-click feature to enable caching. Selecting this feature is sufficient for most websites. In addition to that, Comet Cache provides advanced features like cache clearing on modification of content, the ability to set a manual expiration time, trigger client-side caching and optimization the web server by modifying the .htaccess file. If you’re just getting started with caching, Comet Cache is a good option. Automattic, the owner of WordPress.com, is the creator of WP Super Cache. The plugin has a well-defined options page, aptly grouped into buckets that make sense to anyone who’s familiar with the types of caching mentioned earlier. 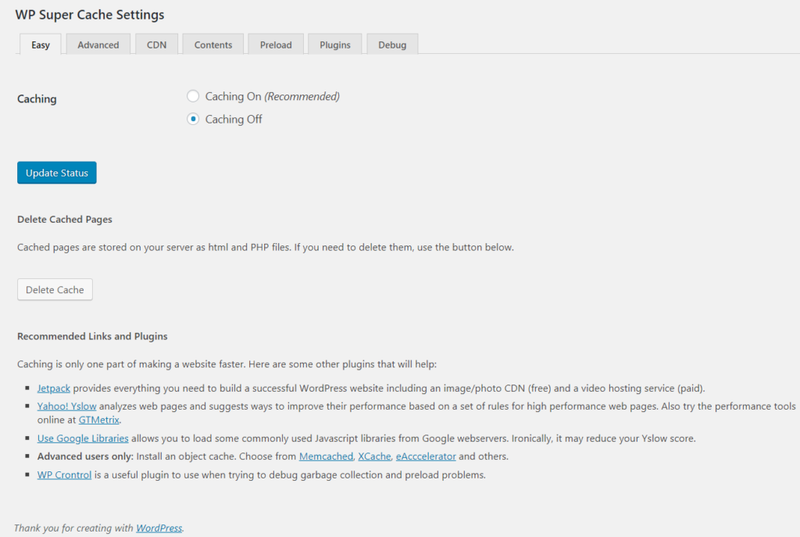 WP Super Cache provides a single-click enable button with default settings too, and also provides CDN support. In its selection of advanced settings, you can select a delivery method for the caching, support for mobile caching and change the cache location. It also provides you with a debug mode through cache logs. Options for caching at page, database, object and browser levels. Import and Export settings, beneficial during migration. Therefore, W3 Total Cache is a one-stop solution for someone looking for a comprehensive solution. There are many caching plugins in the market, and we’ve only showed you a handful of them. Have you given them a try? Do you use a different plugin? Let us know in the comments!